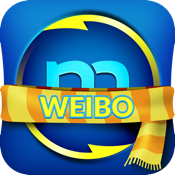 WeiboSync is designed to sync iPhone local contacts avatars with on Chinese Weibo.com and other information to make your contacts and phonebook more vivid. User Experience is the first priority as in our design phase, graphs and functions had been taken all into consideration. We hope you like it and please send us feedback! 1. First time user introductory tour to guide people how to use it easily. 2. Use latest official Weibo SDK and authorized by Weibo.com as registered developer. 4. Taking advantage of iCloud, CoreData to enable us store contact/Weibo user mappings anywhere and any Apple device. 5. Smart algorithm used to suggest contact/Weibo user mappings via multiple information keys. 6. Customizable app settings to allow user to choose iCloud or Wifi-Only to improve user experience. 7. Multilanguage version, available in English, Simplified Chinese, Traditional Chinese.